Ev and I went to Joe's Crab Shack for dinner yesterday. 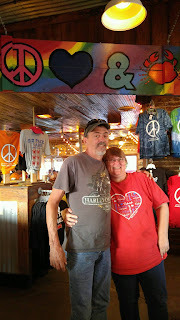 My 'inner hippie' just had to get a picture underneath the peace, love, and crabs sign! haha. Food was good. 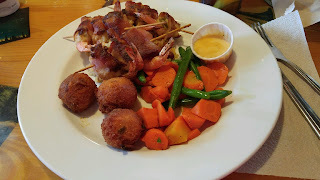 I had stuffed, bacon wrapped, grilled shrimp. Oh, my was it good. It came with hush puppies, carrots, green beans, and rice. Ev had redfish in lobster sauce. This was the first time we had gone there. The meal was good, but the prices were a little high for us. Probably won't go there again unless it's a special occasion.